1. Mark Zuckerberg made a statement. On Facebook, so for anyone who deleted Facebook, here’s the full post. Most importantly, Zuckerberg pointed out that the “thisisyourdigitallife” personality quiz app was installed by around 300,000 people in 2013. In 2014, Facebook changed “the entire platform to dramatically limit the data apps could access”. In 2015, it learned the data the app pulled was shared with Cambridge Analytica, and immediately banned it. And now, here are the key steps Facebook is taking to stop more “bad actors” dirtying its platform. From here on, Zuckerberg will still earn, ooh, about $41 million per day. That’s $US66 million a day less than Jeff Bezos earns. Meanwhile, the power players behind Cambridge Analytica have set up a new company, Emerdata. The suspended CEO of Cambridge Analytica, Alexander Nix, is also a director. He also once referred to two potential clients as “n…..s” in an internal email. 3. Also today in Disgraced CEOs, Uber founder Travis Kalanick is back. He just announced he was investing $US150 million into City Storage Systems and had acquired a controlling stake in it. In the same statement, Kalanick said he would become the startup’s CEO. The startup has 15 employees and a strong connection to Uber. Here’s what it does. 4. The US Federal Reserve raised its benchmark interest rate by 25 basis points to a range of 1.50% to 1.75%, expects another two hikes this year, and steepened its outlook for hikes in 2019 and 2020. Here’s the dot plot you’ve been looking for. In New Zealand, nothing happened. 5. The S&P500 was choppy and the US dollar index immediately slipped back under 90 following US Fed chair Jerome Powell’s first post-rates presser. The greenback dipped sharply across the board, and the Aussie shot up by more than a full per cent. But ASX Futures traders have marked the open a little bit down. Also in Australia this morning, another increase in jobs is expected when the median forecast drops at 11.30am AEDT. Here’s your 10-second guide to that. 6. Are these Donald J Trump Jnr’s Morton’s toes? The Daily Mail investigative team says yes, after seeing Trump Jnr’s feet in another Instagram. So, remember when Trump Jnr’s wife Vanessa filed for divorce last week, and there were rumours of something to do with tweeting? The tweeting may have involved that one above posted in 2012, by pop star Aubrey O’Day, who released a song soon after called “DJT”. 7. Twitter founder Jack Dorsey thinks there will be a “single currency” one day. And that currency will be bitcoin. 8. When was the last time something you bought on eBay from overseas cost less than $1000? Just about every time. And soon you could be adding $5 to that every time. Because that’s how much the federal government is considering charging you for every parcel containing goods worth less than $1000 coming in from overseas. 9. The suspect in a string of deadly bombings in Austin, Texas, was finally cornered by police in his vehicle – and killed himself with a bomb. In another US state, Maryland, a school shooter who critically injured two students was taken down within a minute by a school resource officer. But it’s not just another week in US gun violence – it’s a week in which Americans turned against the National Rifle Association for the first time in 20 years. US Marine Corps/Lance Cpl. 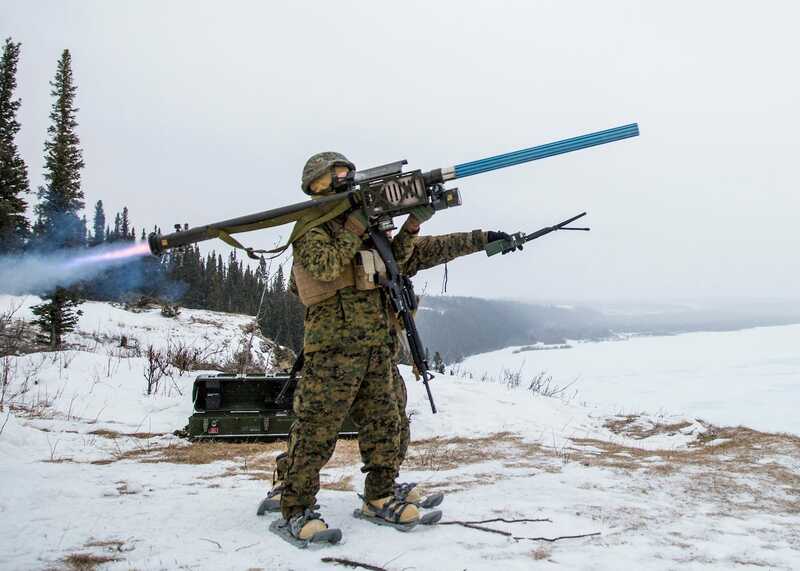 Cody J. OhiraUS Marines with Alpha Battery, 2nd LAAD Battalion fire a Stinger training launch simulator as part of exercise Arctic Edge at Fort Greely, Alaska, on March 14, 2018. And Boris Johnson clearly doesn’t think the UK is poking the bear hard enough, so he compared Putin to Hitler at the 1936 Olympics.